이 염거화상탑지는 얇은 동판에 통일신라 선종승인 염거화상이 844년에 전화한 내용을 해서체를 쌍구체기법으로 전각한 것이다. 염거화상(?~844)은 진전사 원적선사 도의의 제자로 가지산문의 2대 조(祖)로 알려진 인물이다. 동판에 새겨진 탑지의 내용은 비록 소략하지만 단정한 글씨체로서 당시의 서체 연구에 좋은 자료가 되며 축조의 정교한 끌 자국은 금속공예 기술의 우월함을 잘 대변해 준다. 무엇보다 이 몇 줄의 명문을 통해 당대 최고의 고승인 염거의 행적이 밝혀졌을 뿐 아니라 우리나라 승탑의 효시가 되는 염거화상탑의 축조시기를 규명하는 결정적인 자료라는 점에서 이미 국보로 지정된 염거화상탑과 함께 국가지정문화재로서의 중요한 가치를 지닌다. This “pagoda record” engraved on a copper place consists of a text in regular calligraphic script about the life of a Seon monk named Yeomgeo who died in 844. The monk started his life as a Buddhist monk under the tutelage of Seon Master Wonjeok at Jinjeonsa Temple, and later became the second patriarch of the Gajisan Seon School of Buddhism. 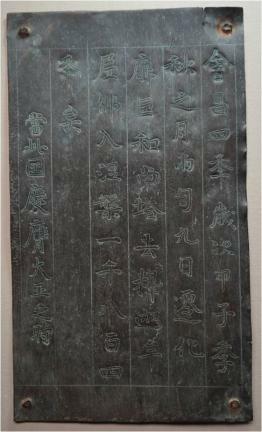 The inscription’s neatly trimmed script provides valuable clues about calligraphy in ninth-century Silla. Similarly, the skillful use of the engraving tool also shows that Silla artisans attained a high level of technical achievement in the field of metal work. Although the inscription consists of only a few lines, it contains important historical information about the life of the eminent monk Yeomgeo and the monument, known to be one the earliest stupas in Korea, built to honor his achievement.